The Training Plan for Athletes Suffering Leg Injury is not a rehab training plan for an injured limb, but rather trains the rest of the body around the injury during recovery. 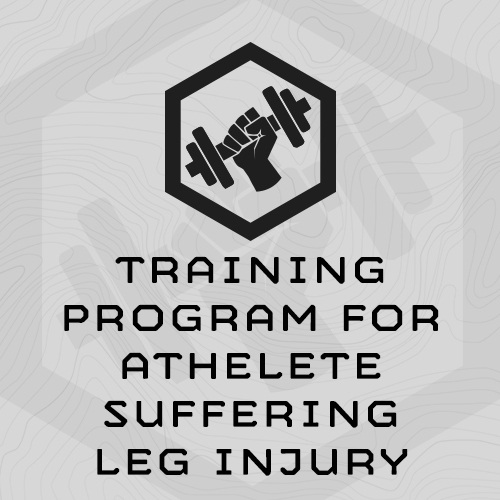 The exercises and programming in this 6 Week, 5 day/week training plan are designed to be completed by an athlete with a single injured leg/foot/ankle, who is on crutches or in a walking cast. Athletes on crutches, walking casts, or walking boots have all completed this programming at MTI. This is a balanced training plan which concurrently trains strength, work capacity, chassis integrity, low back fitness, and endurance. It is a gym based training plan. This is the second version of this plan, updated October 2018. Strength days in this training plan have you training a total body, lower body, upper body pull, and upper body press strength training exercise over two circuits. The training plan deploys bodyweight, dumbbell/kettlebell, and barbell training. You’ll train strength two days per week. This plan deploys 10 minutes and 20 minutes, multi-modal work capacity events. You’ll complete 15-20 minute FIR Circuits 4 times per week. FIR circuits deploy Flexion, Isometric and Rotation core exercise in the same circuit. Generally, around 60 minutes, though near the end of the program, training sessions may take up to 75 minutes. Drop, or “scale” the load or weight as necessary to meet the prescribed number of reps. For example, if the training session calls for 10x weighted sit ups with 45# and this is too, heavy, drop down to 35# or 25#, – whatever is required, to get 10 reps.
How much rest do I take between rounds? None – each circuit generally has a built-in stretch or durability exercise. Consider this your working rest. If the session calls for 4x Single Arm Rows, is that 4x Total, or 4x Each Arm? 4x each arm – 8x total. This is the same for all single side exercises – if it calls for 4x Russian Twists, this means 4x each side, 8x total, Etc. The only exception is step ups. 50x Step ups = 50x Step ups total, 25x each leg. Does a 1-Leg Exercise mean both legs – even my injured one? No – the 1-Leg Exercises are intended only for your non-injured leg. Won’t my uninjured leg become too strong and unbalanced as compared to my injured leg? Your uninjured leg will definitely become significantly stronger than your injured leg …. but don’t worry about it. Studies have shown that some of the strength gains in the uninjured limb migrate to the injured limb. Training the uninjured limb will help you recover faster. The equipment needed to complete this program is readily available in most commercial gyms. In terms of equipment, you’ll primarily need dumbbells and/or kettlebells. This training program is designed to be completed in any commercial gym, with basic equipment. You’ll primarily need dumbbells and/or kettlebells.